If you need Dodge service and repair in Greenwood, you have come to the right place. Our ASE certified technicians have more than 30 years of experience in the automotive service industry. 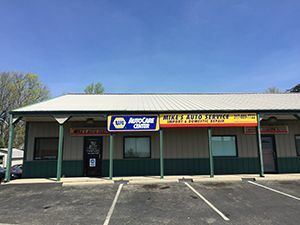 As a NAPA® authorized auto care center, we are fully-equipped to provide a wide range of car repair services for all models of Dodge cars, trucks, and SUV’s. We retain the latest technologies and resources, and use all NAPA® and OEM auto parts for Dodge repair and replacements. At Mike’s Auto Service, you can trust that your Dodge Caravan or Dodge Durango is in the skilled hands of certified mechanics. No matter which model Dodge you own, our auto mechanics have it covered. From factory schedule maintenance and fluid changes, to transmission work, engine repair, and towing services, there is no Dodge we can’t repair or service in Greenwood, IN. In order to ensure we solve the problem right the first time, we use a focused approach to inspect and diagnose your Dodge car or truck. Our ultimate goal is to get your vehicle back in a safe and functional condition, at a price you can afford. Don’t waste your hard earned money at the Dodge dealership when Mike’s Auto Service offers Dodge service at economy-based prices! Call 317-889-7722 for a quote, or to schedule an appointment today.